This holiday time picture book about Nick Cannon and Mariah Carey’s twins celebrating Christmas caught my four-year-old daughter’s eye in the late morning after breakfast. The book was sitting on my dining room table waiting for me to review it when my daughter opened the front cover and immediately focused on the photograph of the Cannon/Carey family on the end cover page. “Is that a girl?” she asked about Cannon and Carey’s son Moroccan. “No. That’s a boy.” I answered. “Because he looks like me. Is this them in for real life?” she asked. The book had already made a positive impact before I offered to read it to her–a far greater impact than the story itself would make. 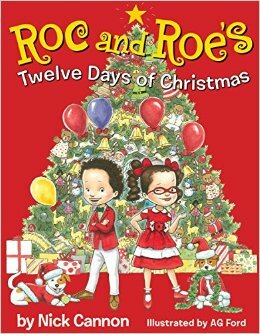 We read this child focused spin on the classic song, “The Twelve Days of Christmas” and by the time the book got to the Fourth Day of Christmas, my daughter was frustrated and bored. She asked why there was no story related to the engaging images of the children singing, playing music, having a tea party and so much more. She frustratedly demanded to know why they kept on repeating the same thing over and over again. There were positives. As indicated, my daughter loved AG Ford’s illustrations and throughout the read, she remained attached to the fact that real kids had turned into picture book characters. My daughter also questioned and wanted to discuss the girl twin, Monroe’s “many” hairstyles. Reflective of reality for many little girls, Monroe sports three different hairstyles in the book, which is something I’ve always wanted to see represented more often in picture books especially those featuring children with African ancestry. While the theme was misguided–an adult writing something they thought would be cute without taking a child’s attention span or need for words and images to connect into consideration, the illustrations are powerful, vivid, and kind of tell a story of their own for those who want to improvise. And, of course it’s always nice to have a high quality picture book that features mixed heritage children in a story not about them being mixed. This is the second book from a major publisher and third with library binding that I’ve seen featuring a mixed child protagonist with a light olive skin tone instead of brown or rich brown complexion so even though there isn’t much of a story for the very young reader, this book goes far in representing the vanilla complexioned multiracial kids that picture books usually forget. By omilaju in Boy Protagonist, Christmas Book, Girl Protagonist, Holiday Book, Mixed biracial Black White, mixed multiracial child on April 4, 2015 .